Tonight in Brooklyn, New York, the WWE will be putting on one of its marquee PPV events, SummerSlam! The line up for this year’s show is seriously stacked with WWE Superstars from both the Raw and SmackDown brands. To commemorate SummerSlam 2017, Homage has released this fantastic WWE SummerSlam t-shirt collection! Now fans can relive some of SummerSlam’s greatest moments with three new tees, a flash sale and free shipping all day long. From Macho Man Randy Savage and Miss Elizabeth’s macho matrimony in Madison Squire Garden to the British Bulldog’s unbelievable victory over Brett Hart in front of 80,000 fans at Wembley Stadium, Homage is repping some of the classics of “The Biggest Party Of The Summer.” The Blot can’t resist the awesome SummerSlam retro logo tee, but Brett Hart and the Macho Man are two of my all time favorite wrestlers. So maybe I should get all three? The WWE SummerSlam T-Shirt Collection is available now, in sizes XS-3XL, at the Homage online store for $32 each. 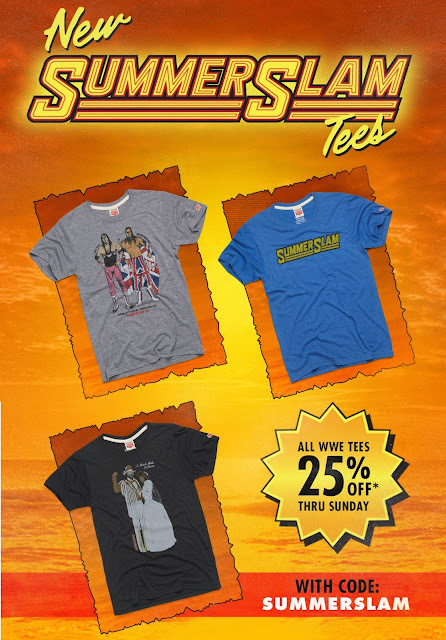 And today only, use promo code “SUMMERSLAM” to get 25% all WWE t-shirts and free shipping!